Doctor Who: "The End of Time, Part One"
"The End Of Time, Part One"
My two favorite things about Doctor Who (particularly Russell T. Davies' reimagining/continuation of it) are its essentially procedural nature and the way the show makes the Doctor into a grand, tragic, operatic hero. Lots of shows purport to be about heroes, but this Time Lord who always, always does the right thing, even if he knows it will bring him certain death, is one of the finest in the medium's history. In fact, I struggle to think of an American analogue. Our TV heroes tend to be much more methodical, chasing after death instead of striding toward it, and even a character like Jack Bauer is rarely played for the sheer operatic fervor that Davies pushes at with seemingly every episode of Who (though he could be). Maybe Buffy Summers. Maybe. Hence, the season finales of Who are episodes that often end up being thrilling while also trying my patience as the story sometimes flits beyond the bounds of just what can be done reasonably on a television-sized scale. Davies' first season finale involved the Doctor regenerating, and he's been trying to top himself ever since, bringing in characters old and new to contribute to the constant sense that the universe is in peril. This often defeats one of the show's strong points: the way it's about one Time Lord traveling the universe in search of fun places to visit and wrongs to put right. When the series brings all of its loose serialization to bear - in the first season, that serialization almost entirely consisted of the words "Bad Wolf" turning up everywhere - it can become something so cumbersome that it has to succeed in spite of itself. And yet, it usually does. For as too-big as the season four finale was, it was still somehow grounded by that sense of the Doctor being the guy who was willing to step into the line of fire, the sense that he seems to bring only sadness to the lives of the people he travels with. The two final David Tennant specials, then, have to somehow top that while also bringing the Tennant Doctor to an emotionally resonant climax. It's not going to be the easiest thing in the world, but "The End of Time, Part 1" finds a way to move all of the pieces into place for the final part of this particular storyline next week. The piece moving isn't always elegant, but it all mostly gets done nonetheless. 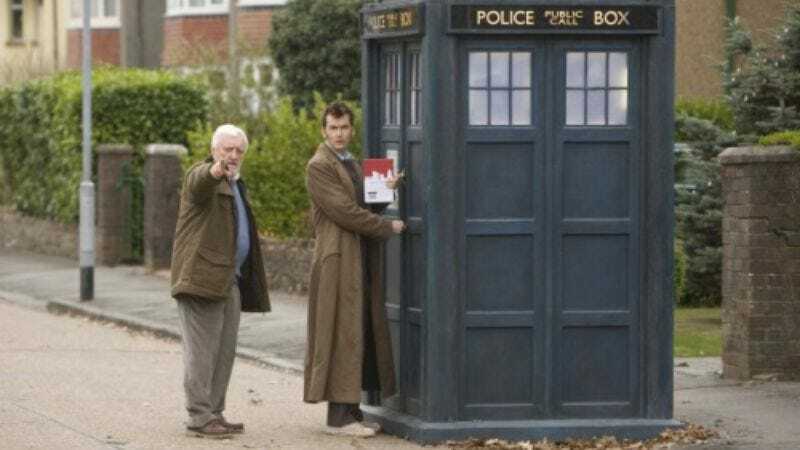 The best thing about "The End of Time, Part 1" is that it grounds most of the early going in the character of Bernard Cribbins' Wilf, the guy who's always wanted to be out on the adventures but ends up stuck at home instead. He arrives too late to the war. 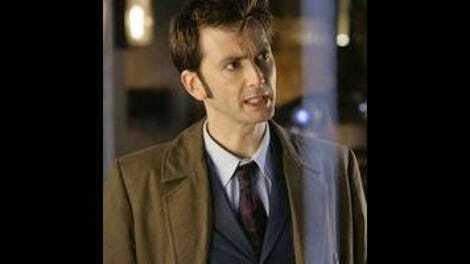 His granddaughter is the one who goes off with the Doctor. He's the guy who's involved somewhat but now must hold on to a lonely memory of what could have been while making the best of it with his other old-timer friends. Considering that the first half of the episode (roughly everything up until Timothy Dalton's first split-second appearance) mostly consists of the Doctor running after the Master and being too late, the episode needs someone like Wilf to leaven some of the silliness with his wrinkled face and emotive eyes. Because, let's face it, there is quite a bit of silliness in the early going. The whole return of the Master segment was not over-the-top in a good way (like Who is at its best), and while I like John Simm's portrayal of the Master, the fact that he's become this all-powerful madman undercuts the show's initial portrayal of him as kind of a cool and collected Antichrist-type figure. Now, he just seems too goofy to take terribly seriously, as Simm's portrayal of him highlights all of the humorous aspects of his madness before he flips the switch to killing people. Granted, that could be eerily effective if handled properly directorially, but something about the direction of this episode seems a few steps removed, as if afraid to truly embrace the Master's true nature. It creates a curious disparity between the threat of the episode - which is truly incredible - and the tone - which is often played for laughs. But that tonal inconsistency begins to resolve itself in a scene where the Doctor takes Wilf to a little pub for a Christmas drink. He's begun to realize he will die (well, the Ood made it pretty clear to him), and this episode begins to reveal itself as the Doctor's attempts to avoid doing what he must, to prolong the good times, as it were. One of the best things about Tennant's Doctor is the way the actor felt completely free to play the sheer joy of traveling all of space and time in a police box, the way he didn't cringe at playing some of the sillier material he was handed and ripped into it with the same gusto he handled the series' more dramatic moments. When looked at through the prism of this scene, the rest of the episode becomes something of a passion play for the Doctor, leading into his death and resurrection. Davies hasn't been shy about using the very Christlike tendencies of this Christ figure in the past, but he really ladles on the not-really-religious religious symbolism here. The TARDIS turns up in a stained glass window, for God's sake. And, really, if you can't do elaborate religious symbology at this time of the year, when CAN you do elaborate religious symbology? And yet I also admire Davies for not pushing the button too hard. He's not having the doctor end up with arms spread wide while hanging from a fence or anything. Instead, he's building a new sort of symbols that seem religious without ever really becoming so - the Master hammering on a barrel to call the Doctor, the empty wasteland the Master lives in, the prophecies of the Ood. It's the Temptation of the Doctor, writ large. From there, the rest of the episode is essentially a momentum machine pushing us toward the final moments when the Master overrides the DNA of all humanity to make every person on Earth an exact copy of him, but for Wilf (somehow protected by radiation) and Donna (with her Time Lord DNA). It feels a rather staid close for an episode that promises so, so much (nothing less than a grand plan that the Doctor and Master are only mere pawns in without understanding it), but then comes the final reveal. Timothy Dalton, our narrator for the evening, is one of the returned Time Lords of Gallifrey. And they're back to … bring about the end of time or something (I'm sure this will be cleared up next week). Given that so much of the series' run so far has been about how the Doctor has been bruised by the death of his race and given how the series eventually ran the Daleks into the ground, I do hope that this doesn't unravel one of the series' most potent operatic strands. But as an episode closer? It's pretty damn awesome, and it makes me impatient for next week. I realize that on a show where one man can look like many different people this might have slipped by everyone, but I am not Keith Phipps. He's away doing family stuff for the holidays and entrusted this episode to me. He will be back for the grand conclusion next Saturday, though. I was amused by how the episode awkwardly shoehorned in Barack Obama to make clear that the black guy who inadvertently brings about the Master's foul plot isn't supposed to be an Obama stand-in. I keep thinking it's the Doctor, Donna and Wilf against the Masters, but I also keep forgetting about the two cactus alien things, who failed to make much of an impression, despite Tennant's playful de-shimmering of both of them. Listen, is there any way Matt Smith can possibly live up to David Tennant? Even if he's the greatest actor in the history of the world, Tennant's such a match for this part that it feels hard to imagine someone taking it over from him. Still, I have all the faith in the world in Steven Moffat (whom I consider one of the top ten TV writers working in the world today) being able to find a way to twist the series to suit whatever Smith's strengths are. But it's going to be hard to just let this performance go. Weird science fiction comparison time: How do the Ood stack up to Avatar's Na'vi? Go.